A few years back K&N employee Todd White and his good friend Matt Dawson spent six months transforming a stock 1999 Harley-Davidson XL1200C Sportster into a one of a kind bobber. We featured it in our July/August 2015 issue. The build was described as a melding of Matt’s vision and skills, with Todd’s hard work and money. The duo was influenced by post World War II era motorcycles, and attempted to create a nostalgic looking motorcycle out of a modern machine. Bobbers trace their roots to the late 1940s and can be considered some of the earliest custom motorcycles. A bobber usually retains stock frame geometry, unlike a chopper, and takes a stripped down, minimalist approach to styling. The 1999 Sportster bobber was Todd’s first custom bike build, and he did such an excellent job that the bike earned him and Matt a first place trophy at the Grand National Roadster Show in the bobber class. Still fresh off that build, and full of excitement about all they had achieved, Todd already had plans to build a custom vintage Triumph motorcycle and a classic Ford pickup truck. As it often happens, life threw a curve ball in the duo’s direction. Matt suffered some dramatic health challenges and Todd took a timeout to start a family with his wife. In recent years, vintage Triumph twins, known for their parallel twin cylinder engines, have become increasingly popular thus becoming hard to find and expensive when they do pop-up. This has led many custom bike builders to pursue other options such as the Yamaha XS650 twin, or in Todd’s case a 1981 Kawasaki KZ440 LTD-A. The Kawasaki KZ400, and later KZ440, falls under the classic “Universal Japanese Motorcycle” or UJM classification common in the early days of Japanese motorcycles. The UJM wasn’t designed to excel in any particular category, especially good looks, but simply intended to be a good all-around motorcycle. Keeping this in mind only helps to appreciate all the hard work and effort Todd put into his custom Kawasaki KZ440. It took Todd over a year and a half to build this beauty during his lunch breaks, thus the name: “Lunch Box Special”. 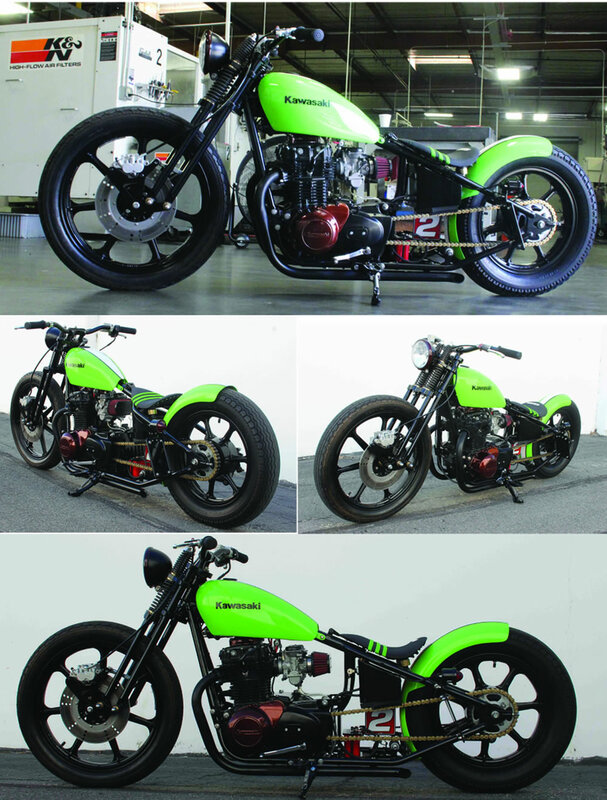 Todd White’s custom 1981 Kawasaki KZ440 LTD-A features many one off custom parts that he fabricated himself. Because most post World War II era motorcycles did not feature rear suspension Todd designed a custom rear hard tail section married to the stock front half of the frame for that nostalgic bobber look. A custom support plate was fitted to the frame behind the engine to add support and a faux oil tank was installed underneath the seat. Vintage Triumph twins, as well as American made Harley-Davidson motorcycles, feature a dry sump engine design with a remote oil tank. The Kawasaki KZ440 is actually a wet sump design, however Todd added the faux oil tank to give his bobber that vintage look as well as give him a place to house the bike’s electronics. The custom seat pan, wrapped in a bold gripper seat cover from Enjoy Manufacturing, rests on urethane bumpers and flips up to reveal a hidden storage compartment for personal effects. Todd’s crown jewel in this custom bike build is the one-off springer front end with trunnion style rockers. When Todd couldn’t find a springer fork that he liked the decision was made to build his own springer front end from scratch. The stock Kawasaki KZ440 gas tank was retained; however Todd sectioned and stretched the tank an additional three inches. A Russ Wernimont Designs rear fender hugs the nostalgic looking Duro Tires. Because the Ballistic Performance Components Lithium battery is almost a work of art in and of itself; Todd left the compact battery in plain sight and instead machined a custom mount to keep it in place. When it was time to choose the color Todd went with Kawasaki Flo Green paint, a traditional blocky Kawasaki logo, and custom striping to give it some additional flair. The bike’s hand and foot controls were all borrowed from a Motocross bike, and the KZ440 bobber proudly wears the number 2 plate after the now retired 4-time Supercross / 3-time Motocross champion and Factory Kawasaki racer Ryan Villopoto. The engine, which Todd completely rebuilt himself, was blacked out using high-temp paint with the exception of the side and valve covers which were powder coated in a root beer brown. Working at K&N has its perks and when it was time to give the KZ440 bobber the superior airflow and superior performance it deserved, Todd built a carbon fiber topped dual flange K&N air filter of his own design to tie the two carburetors together. 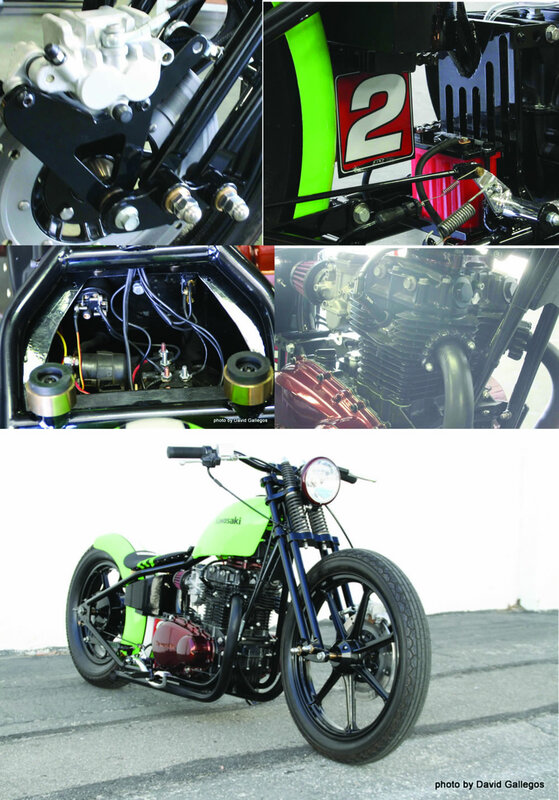 Todd’s custom KZ440 is also equipped with a high-flow K&N Powersports oil filter, number KN-401. Todd would like to thank all the sponsors who helped out during the year and a half of the custom bike build: as Ballistic Performance Components, Russ Wernimont Designs, Enjoy Manufacturing, Biltwell Inc. and of course K&N air filters. 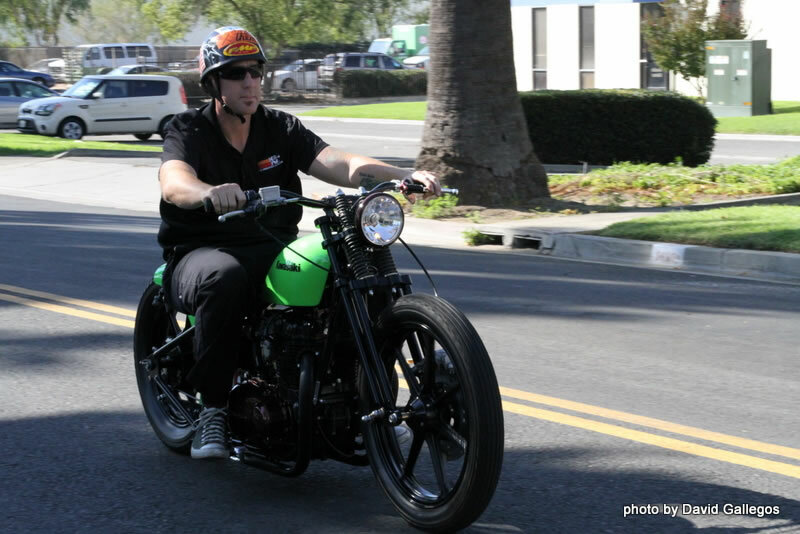 All of Todd’s hard work paid off when he entered the KZ440 bobber in the International Motorcycle Shows (IMS) biker build off in Long Beach, California. Todd was again fortunate enough to be recognized for his creativity, this time with the Editor’s Choice award. When asked if he had any plans to build another bike Todd stated that he planned to take some time off from building to spend as much of his free time as possible with family but, knowing Todd his mind has at least already built the next two. K&N offers air filters, and air filter kits for a wide variety of applications whether it’s for a custom vehicle or stock from the factory. Find K&N products for your vehicle using the K&N application search then use the K&N dealer search to find a K&N dealer in your part of the world.